Check out Paul, The Torch Carrier! 1) Who were the men and women of the Way and why was Saul persecuting them? 2) Who is Ananias and what can we learn from him? 3) What can be learned from Saul’s encounter on the road to Damascus? 5 “Who are you, Lord?” Saul said. 7 The men who were traveling with him stood speechless, hearing the sound but seeing no one. 8 Saul got up from the ground, and though his eyes were open, he could see nothing. So they took him by the hand and led him into Damascus. 9 He was unable to see for three days and did not eat or drink. In the New Testament those who were believers of Jesus originally did not call themselves Christians. These believers first referred to themselves as followers of the Way because Jesus described Himself as “the Way” (John 14:6); the name Christian came later. In order to understand why Saul was persecuting these believers we must first understand who Saul is. Saul was born a Jew, his family line was the tribe of Benjamin, and he was a Pharisee. He was as Jewish as one could get and upheld the law down to the letter. In Saul’s eyes the followers of the Way were dangerous to Jews because they preached Christ crucified and freedom from the Law. He saw them as a threat that needed to be stopped and made it his personal mission to stop them at all costs. Ananias was a disciple of Jesus, one of the men of the Way. He had placed his faith in Jesus and lived in Damascus. He knew who Saul was and his mission. Ananias was given the distinct job of being used by God to heal Saul’s physical blindness. More specifically, God chose to use Ananias as part of his plan to save Saul, to redeem Saul to Himself. Ananias chose to obey God and be used by Him even in what I imagine was great fear for his life in view of Saul’s reputation. Ananias didn’t know if Saul would truly convert and believe in Jesus upon his healing or if Saul would arrest and persecute him. Ananias shows himself as a faithful follower of Jesus in his choice to obey. Saul, a Pharisee or teacher of the law, grew up learning the Jewish faith. He knew who God was and he thought he knew how he was supposed to live. However, one day on his way to round up and persecute more believers of Jesus, God met him in a unique way. Saul suddenly found himself blind and in a dialogue with the God of the universe, the very God he had grown up learning about. During this encounter, God challenged all Saul thought he knew. Saul had a choice to make… would he ignore this encounter or choose to believe truth, repent, and change his life. Saul chose the latter and was never the same. Not only did he choose to accept his encounter as true, but he also immediately put action to his faith. Saul was baptized and Acts 9:20 tells us he immediately began preaching and sharing the truth of who Jesus is. God used Saul’s experience to bring other Jewish believers to Himself. The believers in Damascus as well as the Jews saw first-hand how God is always at work to redeem His people to Himself. These men and women of the Way would have been the first to believe and accept Jesus for who He said He was and begin spreading the truth of the Gospel. For believers today, it would be much like when we refer to ourselves as Jesus’ followers instead of Christians. Saul’s deadly pursuit of these Christ followers remind believers today there has always been persecution to truth since the very beginning. Jesus never promised His followers there wouldn’t be persecution, rather He told His followers the exact opposite. In Matthew 10:22 and Matthew 24:9 Jesus warns there will be persecution because of faith in Him. We are not above persecution today, no matter where we live! Jesus Himself was persecuted to the point of a torturous death on the Cross. When we choose to follow Him, we should expect and prepare for others to hate us and persecute us for holding firmly to truth. However, we are not alone… Jesus walked through persecution and He is with us always! I imagine when God told Ananias to go and help Saul, Ananias found himself caught in a moment of serious decision making. As a disciple who believed in Jesus, Ananias had to be afraid Saul would persecute him upon learning he believed in Jesus, yet he chose to trust God and put his faith into action. Ananias could have chosen to run like Jonah ran when God told him to go to Nineveh, but he didn’t. We can learn from his example. God doesn’t always ask us to step into comfortable or safe situations. There are times God will call us out of our comfort zone and we may be afraid to step out in faith and obey. However, once Ananias obeyed, he was granted a front row seat to Saul’s conversion and what God did through Saul. I imagine Ananias never regretted his choice to obey. The times in my life I have stepped out in faith regardless of fear and gone beyond my comfort zone, I have been blow away to see how God works and what He chooses to do. The choice in those moments is ours, just as it was Ananias’ that day in Damascus… what will we choose? I am sure that day as Saul was literally on the hunt to find and persecute more believers in Jesus an encounter with God was the last thing he expected. However, God personally met Saul on the road to Damascus. Saul was faced with a choice to continue to walk in the path he always had or to accept the truth of who Jesus was and let his life forever be changed. While probably not as dramatic as Saul’s experience, we all have the same decision to make. 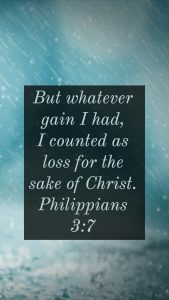 Will we continue in the life that we have always known or choose to put our faith in Jesus and let Him forever change us? 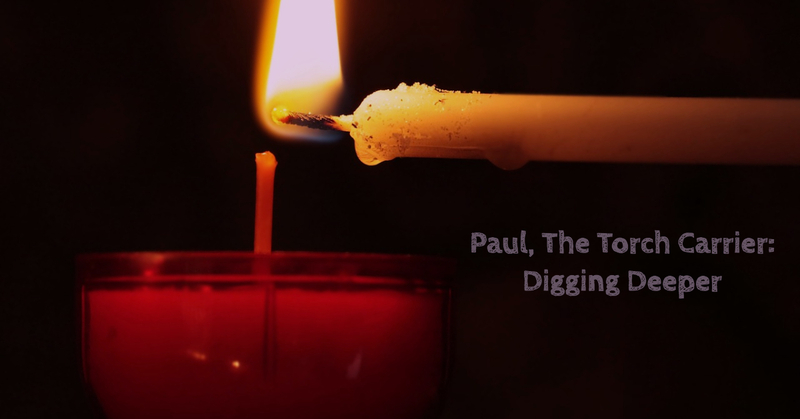 When we choose to let Him make us new, our lives, like Saul’s, should look different. Saul chose to immediately begin sharing the Good News and truth of Jesus and as believers, our calling is the same. The followers of Jesus knew by watching that Saul’s conversion was real; when we accept Jesus and turn over control of our lives to Him we should look drastically different. The world should know we are a new creation by the way we live our lives that we love Jesus. Saul was never the same after that day on the road to Damascus and he never looked back. Will we as believers make the same choice and not look back, instead allowing God to use us for His glory? Catch up with Paul, The Torch Carrier!